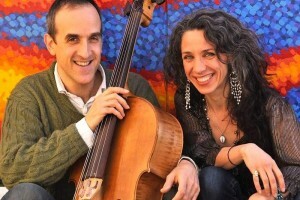 Immerse yourself into a world of music with unique Brazilian and African spirituals at Baur’s Listening Lounge this April 30th featuring Bethany Yarrow and Rufus Cappadocia with special guest Brahim Fribgane. Bethany Yarrow and Rufus Cappadocia are known for their soulful interpretations of folkloric and spiritual music. With startling power, they weave a tapestry of deep groove, sweet melody, and inspired dance that take audiences on a journey around the world and through time — sparking a fire-in-the-belly, soul-stirring experience that lingers long after the concert ends. A rare appearance for the Brooklyn based duo, they will be joined by celebrated Morrocan percussionist, Brahim Fribgane. A special treat for Denver music fans, Baur’s Restaruant will be open for nightly service including dinner and drink specials as well as delectable desserts. Daughter of folk legend Peter Yarrow (Peter, Paul and Mary), Bethany Yarrow absorbed a huge amount of traditional American folk music, blues and spirituals in her early childhood which permanently rooted her in the voices of her ancestors. Throughout her life she has continued learn and study traditional songs and prayer musics from all over the world. Bethany’s tour-de-force stage presence, mesmerizing voice and deep knowledge of the material allow her, like a musical medium, to transmit to audiences the truth, beauty and prophetic messages of these songs. Rufus Cappadocia is renowned for his cross cultural collaborations, taking the cello into previously unexplored realms. Cappadocia has collaborated with a wide spectrum of world music artists, and through his work with West African, Haitian Vodou and Arabic Music his unique musical voice traces the lineage of American music back to its root sources. Brahim Fribgane, Moroccan percussionist and oud player is a master musician who has performed with many great artists at festivals throughout the world. Brahim has played with Dr. L. Subramaniam, Leni Stern, Vishal Vaid, Club d’Elf, Sami Yusuf, Hassan Hakmoun, Will Calhoun, Adam Rudolph, Zakir Hussein, Giovanni Hidalgo, Malika Zarra, Hamid Drake, Selva Ganesh, Steve Gorn, Larry Coryell, Reggie Workman, Hubert Laws, Corey Segal, Adam Deitch, Pete Seeger, Amit Chattergee, Medeski Martin & Wood, to name a few. He has recorded with Harry Belafonte, Paula Cole, Club d’Elf, Jamsheid Sharifi, Leni Stern, DJ Logic, Malika Zarra, and Morphine, among other talented artists.